You must place the numbers 1-9 in the 9 squares, using each number only once. The number in each circle should be equal to the sum of the four surrounding squares. Each colour sum is correct. This puzzle turns out to be trickier than it looks, and this was the intention according to this little bit of history. The puzzle was created by Jai Gomer of Kobayaashi Studios. The three pictures below show my workings to solve this puzzle. To start with we have 9 unknowns and 7 equations so clearly an indeterminate system; hence brute mathematical force alone won’t be sufficient. Applying a bit of logic we can deduce two of the numbers. At this point I thought great, now I have 7 unknowns but 7 equations. However this was very foolish of me, as in fact we only really have 5 equations for our remaining 7 unknowns. And so, I had to make a few educated guesses on the likely magnitudes of some of the unknowns based on the totals that they contributed to. Once I had done this, the other unknowns dropped out fairly easily and a quick verification at the end showed that I had all the values correct. It could have been different though if I had been incorrect with these educated guesses. Have I missed something? Could I have done it without these educated guesses? Could I remove one condition and the solution still be unique? Would colour totals split into 3,3,3 squares instead of 2,3,4 lead to easier or harder puzzles? 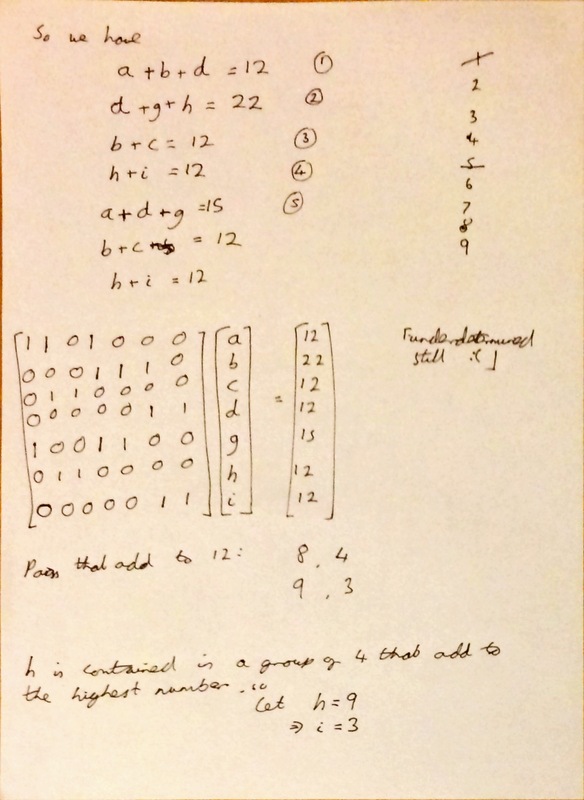 I suppose I did something similar to you, but I left out any linear algebra techniques. After finding the 1 and 5 from the orange and red colors, I listed all possible combinations for each color. For red, there were two combinations left (A: 9,3 and B: 8,4); for orange, there were two possible combinations (A: 9,5,3 and B: 8,5,4), and finally for white there were 6 combinations. Looking only at which combos work with each other, we get that only AB followed by white’s (1,2,6,7) and BA followed by white’s (1,2,6,7) work. 7 – ? – ? 6 – ? – ? Worth noting that this “educated guess” can be wholly confirmed by imagining we did let the middle left be 2, then that means we would need the bottom left and bottom middle add to 20, which is absurd. I always enjoy seeing how people have enjoyed playing my puzzles, and how they continue to tax the minds of players! I also enjoy seeing the different solving methods used by the wide variety of people playing Suko and Sujiko around the world. Thank you for this post. It’s easier to use simple logic. Middle square must be 1 to make higher 18 total. Three of the white squares plus left-hand red square make 23, but same three white squares plus top left square make 16. Hence left-hand red square must be 7 greater than top left square. We’ve already used the 1 so it must be 2 and 9. Then the other red square must be 3, and we can put in 5 to complete the lower 18 group. The middle and right hand squares on the top row must total 12. Only possibility left is 4 and 8. 4 must be on the left or you get a duplicate 2 in the 13 group. Then 6 and 7 go in easily to complete the puzzle. It’s a lot quicker to do this than to write it! Yes definitely quicker to do it than to write it! May reply to this in another year’s time ! 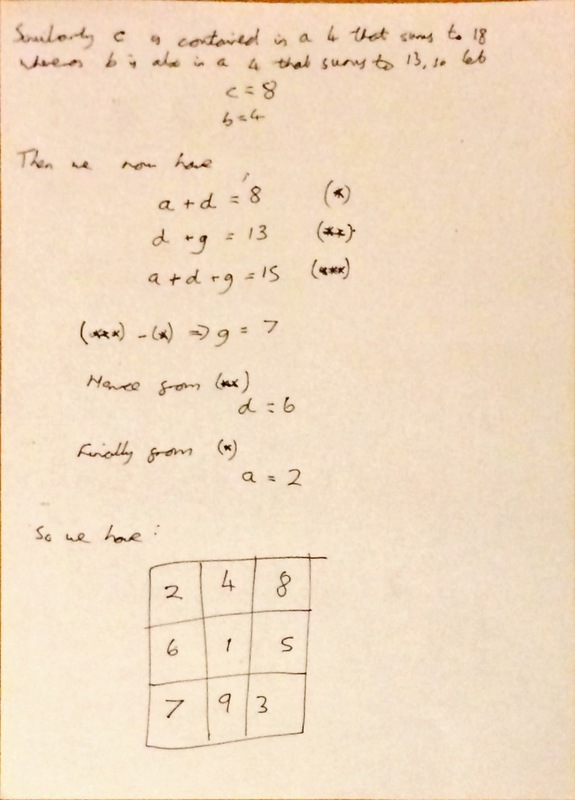 Meanwhile, does anyone know of any free software to solve Suko puzzles, including finding multiple solutions if any? Hi Richard. 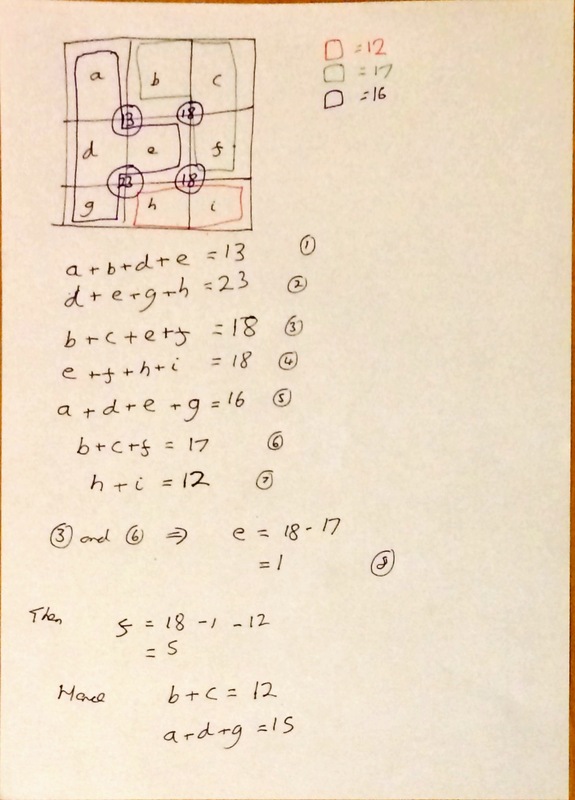 There are sites such as [ http://www.herrmann.me.uk/script/puzzles.htm ] which offer help with solving Suko and Sujiko puzzles, along with Master Sujiko. I’ve not offered such a facility myself for two reasons – 1. Because others can build this kind of programming better than I can, and 2. I think it takes away from the challenge when the solution is only a click away! Still, as they say, different strokes for different folks! I must say that your working method on this puzzle is very much the same as mine [ I work through each puzzle manually when creating them, to ensure that they can be played by humans, as well as machines 🙂 ]. I’m chuffed to see people still playing, and enjoying my puzzles, so thank you for that. Thanks Jai, my main concern was to find a way of checking for duplicate solutions. 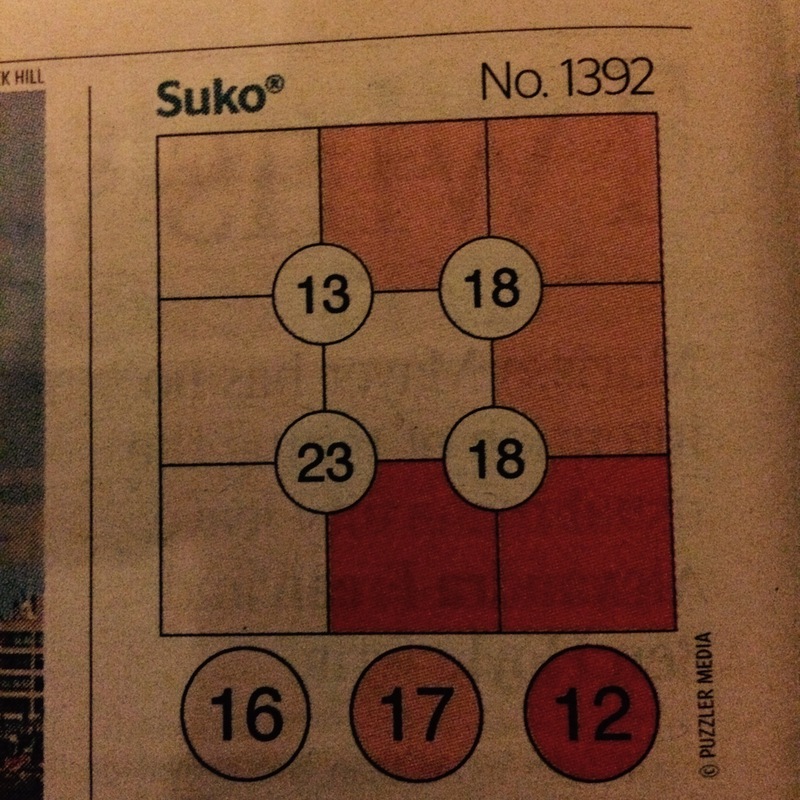 I enjoy doing the Suko puzzles in the Times newspaper.